I stayed at SP Barakah Chalet with a travel friend and at the end of our Tioman trip, we'd concluded that if you're looking for a decent place to stay that's friendly on your budget, yet still offers quite a few extras, then SP Barakah Chalet is just the ticket. 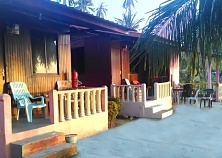 In fact, I'd spotted on Booking.com that Barakah is one of the Tioman accommodations that offers some of the best value for money. Well, this really showed; Barakah offered quite a lot of bang for our bucks. For starters, SP Barakah Chalet sits pretty much right at the beach. Well, that is, the Seaview rooms. And I do recommend you get one of these, because even though they're a tad more costly than the other rooms, you'll find that room rates are quite feasible at SP Barakah Chalet. Incidentally, Tioman being a tropical island, I'd also advise ensuring that your room has air-con. Sure, a fan does refresh you quite a bit during the day, but at night, a fan just isn't enough and will hardly de the high ambient temperature. You'll fall asleep eventually without air-con, but it'll be pretty fitful sleep at best, and you'll feel pretty knackered the next day. Really, get an air-con room, it's ever so worth it. Barakah also has a restaurant, which is great for when you wake up and want to dig into a meal without the need to walk too far. Come to that, the Barakah restaurant became our go-to "makan" place for both the tasty meals and the great and peaceful view. By the way, our room didn't come with breakfast, but the dishes were priced quite nicely. If you're not just looking to lounge around but you want to do things as well, then have a chat with the Barakah staff. They're not only very kind, but they'll also be able to set you up with snorkeling, fishing, or even scuba-diving. Now, there were a few grumbles here and there, our main one being the slow wi-fi speed at Barakah Chalet. Of course we can't say if this is because of Tioman's remoteness or Barakah's internet plan being at the lower end, but we've since heard that most of the smaller family-run chalets in Tioman tend to have the same problem. Bottom line: if you're not too bothered, then no worries. But if you're the type that needs his or her wi-fi fix ever now and again, then best stay at Berjaya or Condotel. I heard their wi-fi has above-average speed. That is to say, when it's not ultra-peak season of course, like Chinese New Year or Hari Raya, or the months of July or August. But for us, we'll be staying at Barakah again next time. Tip: Couple of tips to make your stay at Barakah even more pleasant. If you're into night-life, then look elsewhere; Barakah's main draw is its unrivaled serenity and awesome surroundings, not its nightlife. Also, bring soap and shampoo, because it isn't included. And while you're at it, bring some mozzie coils or similar, as well as sun block. The former to make sure you'll be able to enjoy lounging on your balcony at night and the latter because the sun in Tioman doesn't take prisoners. Lastly, at just over a handful of chalets, it makes a lot of sense to book your Barakah Chalet room in advance, either by contacting them direct, or by doing a booking on Booking.com.